The 2017 Crick Boat Show opens on Saturday morning and we’ll be there. We’ve expanded to our largest ever stand – on a corner near the centre of the main marquee, larger than our 2015 corner stand. Please come and see us. 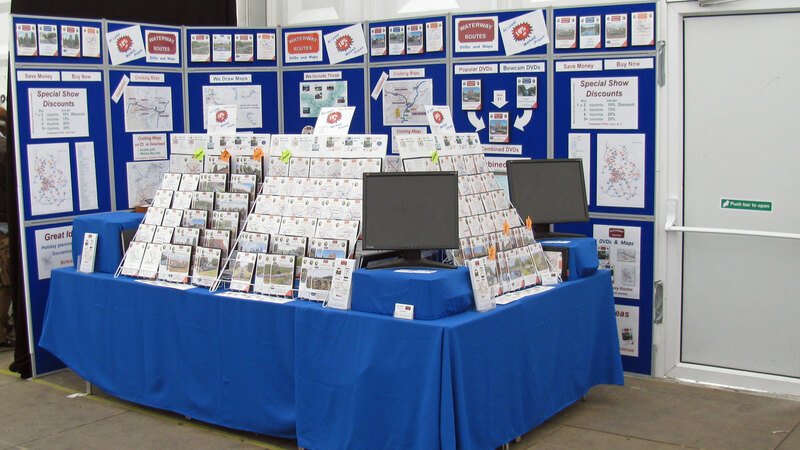 Waterway Routes stand at 2015 Crick Boat Show. The car is looking very full, and and we’ll be setting off early tomorrow morning. Friday is always a busy day, getting everything set up for a smooth start on Saturday morning. We’ll have the May 2017 version of all our maps, that’s issue 62, and you can update to the latest version at a discounted price. If you are doing that it would be very helpful if you can email in advance so we can reserve a copy for you and calculate the discount in advance. We’ll have our full range of DVDs there too, including this winter’s three new releases, River Wey and Basingstoke Canal DVDs, Kennet & Avon Canal DVDs, River Severn and Gloucester & Sharpness Canal DVDs. Best of all, there will be special show discounts. Please visit our stand to enjoy them. Hope you have a good show and plenty of sales. We will be moored up in Abingdon for the weekend, so not attending this year. Another update for you. The unofficial moorings either side of Days Lock on the Thames now have a charge. We found this out last night when he came round at 6pm hammering new signs in and asking for £8. As there were no signs when we arrived we said it wasn’t fair to be charged. We were told basically, pay or leave, so we left.